Cold Turkey, as well as being a witty blog title, describes the abrupt cessation of something, as opposed to a gradual process of stopping. In our case, this was the abrupt cessation of having any feeling in our hands, feet or faces shortly after going outside and for a considerable period after going back inside. 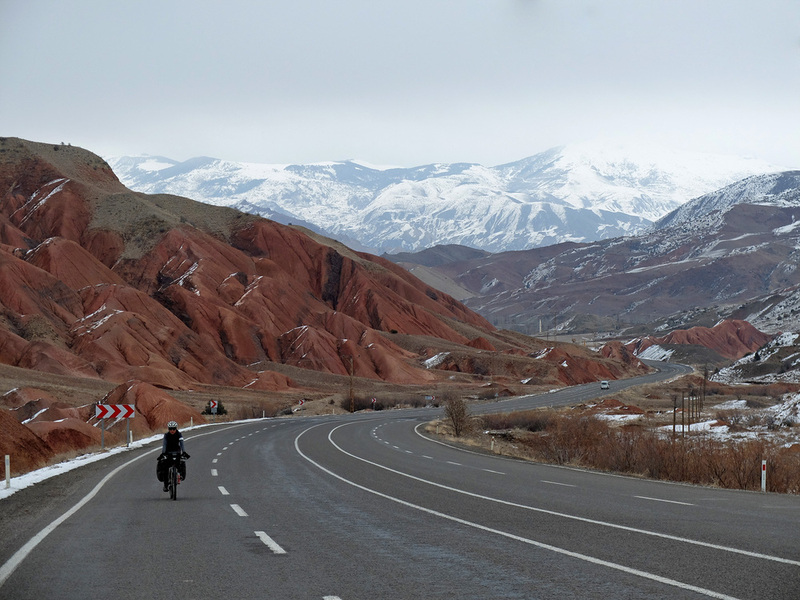 We had envisaged free wheeling triumphantly into Turkish spring time, eating lots of baklava and picking up the pace a bit post central asian winter. We did find baklava, but if we took it outside the shop it would quickly freeze solid, and eating baklava with three pairs of gloves on was immensely impractical. After crossing the border from Georgia we made it an impressive 20km before being escorted onto the Anatolian plateau with the bikes crammed in the back of a Jandarma 4x4 having been refused the right to carry on over the pass on two wheels. To be fair, they were probably right to stop us and this set the scene for the next few weeks as the day time temperatures hovered between -20 and -30. It was was cold enough to freeze the inside of our nostrils, shatter water bottles and leave us pedaling single speed; cables and cogs amassing too much ice to function. With camping impossible, or at least with the kit we had, we were grateful for the string of couchsurfers that had us to stay on our way through Eastern Turkey. Keeping riding stints as short as possible we would arrive cold and bruised from multiple slips on the icy roads, to be thawed with çay, turkish coffee and Salep. The Turkish are rightly proud of their country and its hospitality but ours were quick to point out that a) we were in the east of Turkey at completely the wrong time of year and b) we were idiots. We were particularly happy to be inside when the night time temperature dropped to -50 and having inched our way into Erzurum decided to take a train to try and get a bit further west. Not long off the train, which had stopped frequently to allow ice to be chiseled off the doors, it was a balmy -10 and we were heading for the Cappadocia region, right in the middle of Turkey. It’s a world of bonkers rock formations, deep valleys and troglodyte dwellings. It’s best viewed from a hot air balloon, so we’re told, and ‘the’ Cappadocia image is of hundred of balloons launching the summer tourists into the early morning sky. A winter visit had it’s benefits and we hitched around the best bits chasing balloons without too many crowds. On our last and clearest morning we watched 27 balloons go up whilst listening to the call to prayer echo down the valley. After Konya we felt like we might just have escaped the cold, both getting down to t-shirts on the climb out of the city. Keen to get back to camping we pitched in a pine forest only to wake up to the roof of the tent drooping under the weight of a fresh inch of snow. Too soon! Diet improving with fresh fruits in abundance, mostly grown in the same country believe it or not, just further south where we’re told it’s nice and sunny. Service station stops in Turkey have been a pleasure for cyclists with çay, wifi and a place to sleep often readily on offer. In fact, if we leave one without a least a few cups we’re pretty disappointed. Rolled in to Denizli excited in part by the prospect of meeting family in Istanbul, but mostly by the two kittens our couch surfing host had promised.